I do have the time to edit this one, but I think if I did I might just re-write it. Above the canopy of the forest, the full moon lorded over the mountains and valleys. Surrounding it, its billions of soldiers shone to attention. A fine mist was forming just below the mountain peaks. Everything was cast in the steely blue light of the early hours of the morning. Below the canopy, however, was a nest of blackness in both nature and humanity. 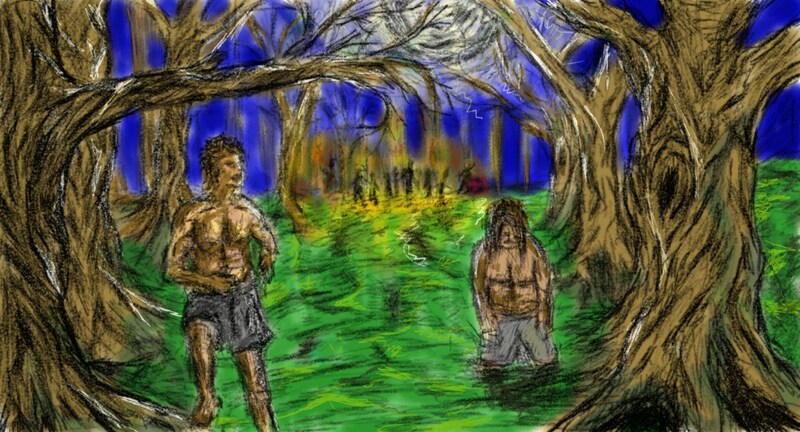 Branches slashed him and tore his skin to pieces as he ran through the forest. By now he must have be a mere shred of himself. They’d been running for hours. Leaping over boulders, branches, roots and streams; catching a few moments’ worth of breath in embankments or in bushes, their bodies were strained beyond anything they had possibly imagined. They were young. Leo was only thirty-one; Hans thirty-two. Neither felt a day under a hundred. They’d already lived too many lives they’d should have lost. How they continued to survive the peril and mortal danger they faced daily they had never begun to comprehend. It was the autumn of 1943. They both knew they shouldn’t have lived this long and they were grateful for every second they had stolen from death. Tonight, though, was the night that the scythe was finally catching up with them. It happened as if it had stemmed from their very nightmares. One minute they were slowly closing their eyes and the next there were shots firing; fires burning and screaming. Their safe commune in the mountains had been discovered. Black jackboots tore men from their beds. Leo and Hans were one of the fortunate few. Leo and Hans had sneaked out through a loose board in the shed that they slept in. The crisp cold air of reality bit at them as they crawled over the fallen and fatally wounded. Many of their friends, their comrades, lying with their faces in the dirt – murdered. Denial and the survival instinct kept them alive as they fled, the uniformed assassins’ silhouettes heart-wrenchingly back against their burning homes, flames licking the skies and ash falling like rain. Over an hour later, and they will still being pursued. They must have been spotted running into the trees. They were now miles away from their secret settlement in the hills and had contoured a large part of the mountain. Dawn was still hours away though and by the proximity of the hounds on their trail, the chase was far from over. Hans, being the stronger one, was further ahead than Leo. They’d grown up together in the same small village in the country. Together, and tonight, they had it at the back of their mind that they might die together. For a long time now Leo’s body was failing him. His chest was tight against him and every breath was a struggle. Only adrenaline was keeping him going. Hans turned to see Leo stop in his tracks, catching his breath by a tree. From somewhere in the darkness behind him torches glared, dogs barked and men shouted orders and death threats. Leo took a few more breaths and looked up at Hans. Exhaustion must have been etched into every crevice of his body and was radiating out in every direction for Hans’ positivity faltered. They were getting closer now. Leo turned back to see the torches almost upon them. Any second their light would fall on their hiding place. He looked up into his dear old friend’s face and tears ran down his cheeks. Hans looked deep into Leo’s eyes and knew exactly what he was talking about. He nodded. Leo bit back the tears and fear as his friend wrapped his arm around him for one last time… No words were said between the two as Hans’ grip loosened and ran off into the black, not daring to look back. “Don’t shoot! Don’t shoot!” Leo raised his hands in the air. They converged on him like a pack of wolves. “Throw down your weapon,” one of the soldiers yelled. One of the soldiers stepped forward and threw Leo against the tree. “What is your name?” the soldier whispered in his ear. Leo, in his last moments on earth, was stunned by humanity. The soldier stepped backwards. Another soldier cried out an order. Leo shut his eyes and remembered all that he had fought for. He thought of the tree he used to climb when he was small. He was there now, as if it were yesterday. There was a clicking noise of metallic mechanisms. Leo started to climb the tree – he knew where all the branches were. The soldier yelled another command. Hans was up there too – further up than Leo was. They waved at each other as the sun sparkled through the leaves above. A deafening sound hit Leo’s ears, but by now he was at the top of the tree and looking down on the tiny world around him, lording over his kingdom like the full moon did the day he died. ~ by S.G. Mark on October 16, 2011. Bravo on the heart-warming comedy, that takes cues from Something About Mary and the Goonies. Nothing like some Nazis to cheer us all up! NEVER GO DOWN WITHOUT A FIGHT!! -That’s wot i say. This entry was posted on October 16, 2011 at 9:08 pm and is filed under Action, Drama, Previous Stories, Thriller.You can follow any responses to this entry through the RSS 2.0 feed.You can leave a response, or trackback from your own site.